KUWAIT: Theft can happen at any time and even in broad daylight, right in front of you. This week a Salwa resident experienced the most shocking theft when a man enquiring about a classified ad she’d posted offering to sell her father’s antique oud stole the musical instrument from her. On Monday evening, the woman received a call from a man claiming he was interested in buying the 50-year-old oud she wanted to sell. She gave the man her address and at the agreed upon time, he drove up in front of her building. When the man got out of his car, he left the engine running. He spoke with the woman for a few minutes and asked to examine the oud. First he said it needed repairs and bargained a bit on the price. He also offered to swap the oud with another poor-looking one, but the woman refused. He asked to take the oud for a day to try it, offering her any form of guarantee, but she again refused. The man then asked to ‘try’ it out, saying that he needed to sit down to play. As they were standing on the street curb, he suggested that he get back in the car. He then said he was thirsty and asked for a glass of water. When the woman turned to go into her apartment and bring some water, the man sped off with the oud. When she tried to call him, the man turned his mobile off and blocked her. The shocked woman immediately went to the police station and gave them the suspect’s vehicle’s license plate number. The police officer told her no investigators were working and told her to return the next morning. She went again the next morning to file a case against the man for theft of the oud, giving police the conversation records on her phone in addition to his car’s plate number. The investigator called the man, who seemed very cooperative on the phone and promised to come to the police station. After an hour, the police officer called him again, and he claimed he was on the way. After another hour, the officer called him again, and he again said he was on the way. But the suspect never showed up. So the police officer advised the woman to file a case that would be transferred to the criminal investigation department to arrest the man. A sentence for theft can include imprisonment between one to three years. After the police calls, the man seems to have realized that the theft would not go unreported and that there was enough evidence of the crime. So after failing to come to the police station, despite being called repeatedly by a detective, the man sent the stolen oud by taxi back to the woman’s address. 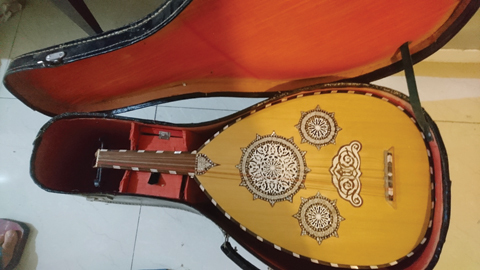 As the oud was returned, he no doubt is hoping that the case will now be forgotten.All the events, including the return of the oud – now with a broken piece – have been recorded and included in the case file at the police station.